The Docks is an eye-opening journey into a giant madhouse of activity that few outsiders ever see: the Port of Los Angeles. 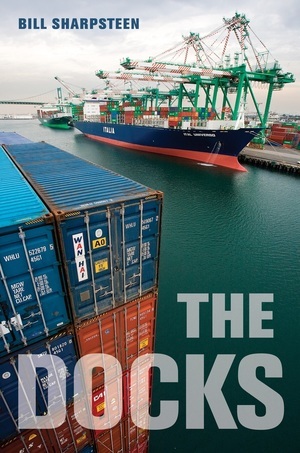 In a book woven throughout with riveting novelist detail and illustrated with photographs that capture the frenetic energy of the place, Bill Sharpsteen tells the story of the people who have made this port, the largest in the country, one of the nation’s most vital economic enterprises. Among others, we meet a pilot who parks ships, one of the first women longshoremen, union officials and employers at odds over almost everything, an environmental activist fighting air pollution in the “diesel death zone,” and those with the nearly impossible job of enforcing security. Together these stories paint a compelling picture of a critical entryway for goods coming into the country—the Port of Los Angeles is part of a complex that brings in 40% of all our waterborne cargo and 70% of all Asian imports—yet one that is also extremely vulnerable. The Docks is a rare look at a world within our world in which we find a microcosm of the labor, environmental, and security issues we collectively face. Bill Sharpsteen is a writer and photographer based in Los Angeles. He is the author of Dirty Water: One Man’s Fight to Clean Up One of the World’s Most Polluted Bays (UC Press), and his articles have appeared in the Los Angeles Times Magazine, Los Angeles Magazine, and The Washington Post. He is also an award-winning documentary producer.